I was posed with a question this last weekend that took me by surprise. I was enjoying some time catching up with old friends who were curious about what I have been up to in regard to work and home life. As I began to talk about recent projects at work, I showed them some elevation drawings of a new Grandmother clock design, which I have spent the last three months developing. After showing them my intended design, I was asked what the difference between a grandmother clock and grandfather clock was. Growing up, my own Grandmother’s pride and joy was her Montgomery Ward Grandmother clock, which she purchased in the late 1960’s. It sat at the edge of her living room, graciously welcoming visitors from the entryway hall just after they entered the front door. The clock featured a tapered waist cabinet section, which made the clock resemble that of an hourglass shape. Grandmother clock cases are described as tall case clocks or floor clocks, which are smaller than 6-1/2 feet in height. Let’s not confuse these with Granddaughter clocks, which are even smaller versions of floor clocks (usually no larger than 5 feet in height). Oddly enough, this is the farthest historical descriptions go. 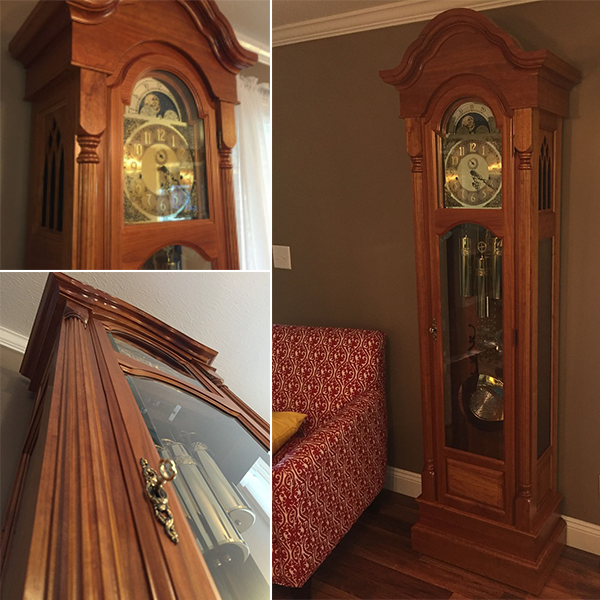 This means that Grandfather clocks can certainly have a tapered waist, but will still be classified as a Grandfather style clock providing the clock is over 6-1/2 feet in height. Grandmother style clocks, in turn, can certainly have a straight waist section (and straight case design) providing the clock case is less than 6-1/2 feet tall (and over 5 feet tall). In summary, the shape of a clock has no bearing on a clock’s type. Instead, designation is simply a matter of height, and nothing more. You might ask, where does this leave my latest project? Can it, in fact, still be called a Grandmother clock with this new revelation? I must admit that I returned after the long holiday weekend on Tuesday with reservations. I am, however, happy to report that it can. Despite the shape of the clock being that which many might associate with a “Grandmother clock” shape, I am happy to report that it will fit the current technical classification agreed upon by many clock experts and historians. 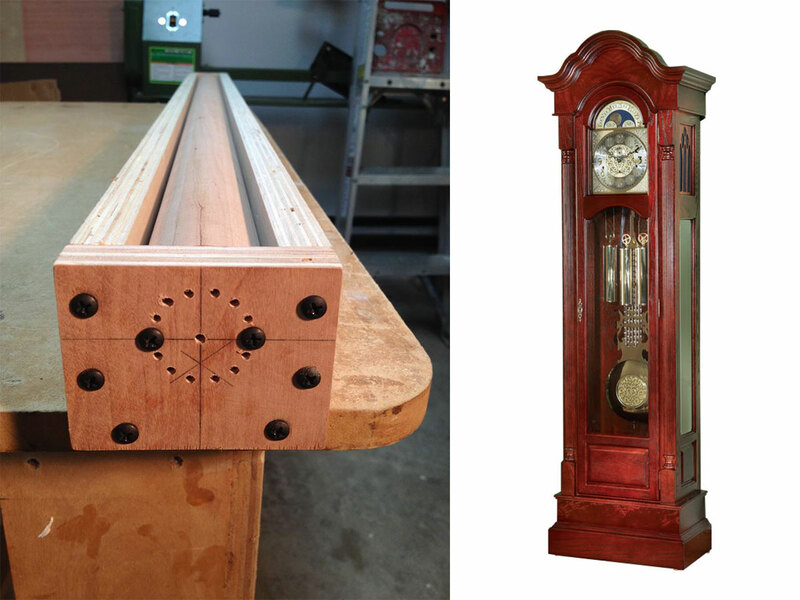 With a total designed height of 75-3/8”, this assembly will just make the “cut-off” for being classified as a true Grandmother clock. Curious about “Project Delaware”? Find out more in the coming months right here on the Klockit Blog!